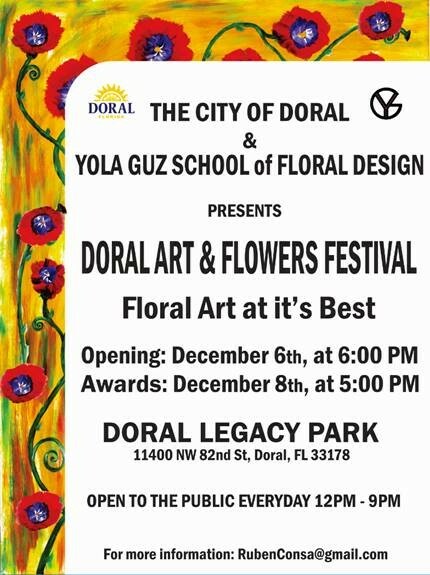 Doral, FL – During Art Basel Week, Doral Legacy Park will be transformed into a modern garden for the Doral Arts & Flowers Festival, produced by Yola Guz and Ruben Consa, from the YOLA GUZ School of Floral Design. Sculptural pieces of art created with flowers, plants and organic elements using unconventional materials such as steel, aluminum and wood will adorn the interior and exterior of the community center and park. The impressive arrangements displayed are created by local florists and artists. The exhibit will be inaugurated at Doral Legacy Park, on December 6th at 6:00pm. The exhibit will be on display until December 8th and culminate with an awards presentation and reception beginning at 5:00pm. Ruben Consa is the imagination behind the festival, intended to promote flowers as art, as well as promoting Doral’s booming floral industry. Mr. Consa is an international floral designer and Doral resident who has been involved in the floral industry for over 30 years as a designer, flower shop owner, educator, commentator, consultant and promoter of floral products. Since 1989, he has been an active member of the American Institute of Designers of Flowers (AIFD), an organization of about 2,000 members worldwide dedicated to the highest standards of professionalism through education of floral design. Mr. Consa has hosted floral shows in the United States, Europe, Asia, South America, and the Caribbean. In the latter part of 2010, with his wife Yola Guz, Mr. Consa established the School of Floral Design Yola Guz in Miami, Florida. The Yola Guz School is now the leading educational institution in South Florida where students are educated to become floral enterprise design, operation, creation professionals.